Crinum is a large genus of bulbous perennials grown for their beautiful flowers. These lovely bloomers come from tropical and sub-tropical parts of the world and are admired by gardeners for the wide range of colorful blooms. Crinum, commonly known as Crinum lily, produces large green leaves that usually die back in winter and appear again in spring. From the center of leaves, appears a tall flower stalk in spring and summer. The flower stalk can be as tall as 60 cm and is terminated by a group of prominent flowers. Flowers last for a long time and emit a light, sweet scent. Crinums can be grown from seeds though some varieties can be propagated from divisions as well. 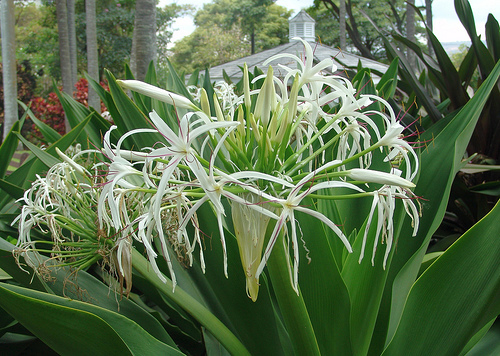 Most species of Crinum benefit from full to partial sun but protection from direct exposure to scorching sun. Provide your Crinums with well-drained but slightly moist and rich growing media in spring and summer. Keep them rather dry in winter. With their fresh green leaves and long-lasting flowers, Crinums make good plants for garden borders as well as excellent container plants. They also thrive well along ponds and pools. C. bulbispermum is characterized by large green leaves and a long flower stalk that bears a bunch of funnel-shaped flowers. C. paludosum is a rather smaller plant and produces arching green leaves and a bunch of white and pink flowers. Crinum x powelii is a hardy plant and produces larger clusters of pink flowers in summer and continues to bloom till the early fall. A large number of hybrid verities are also available easily. Some popular hybrids include: C.’Birthday Party’, Crinum x digweedii ‘Connor White’, and C. ‘Elizabeth Traub’. 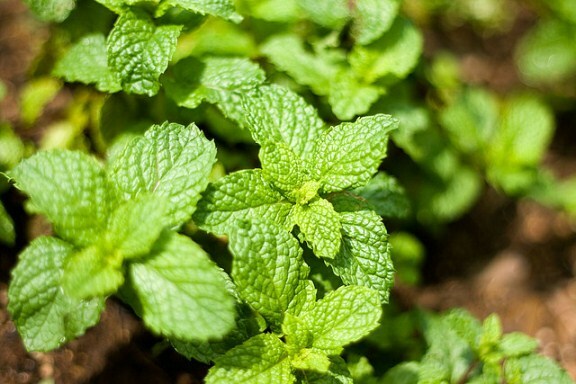 Mint is one of the easiest herbs to grow. It just requires sunny or partially shaded spot in a moist and regular soil mix. Mint can be grown from stems cuttings (3 to 4 cm) that can be planted into the moist soil or water until cuttings develop roots. 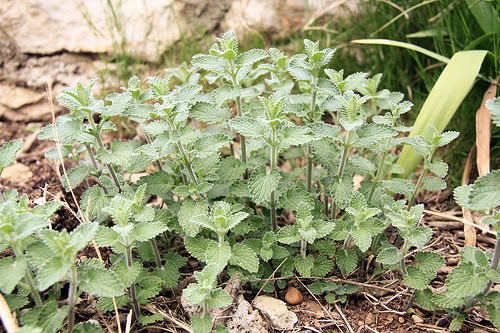 Mint can be grown in pots or directly into the ground. Established plants can be harvested in from spring to fall. A number of varieties and hybrids of mint are available that differ in terms of height, fragrance, and texture of leaf. Besides commonly grown species of Mint, some unusual varieties can also be grown at home. These include: Mentha suaveolens (Apple Mint), Mentha x gracilis (Ginger Mint), Mentha ‘Berries and Cream’, and Mentha spicata ‘Tashkent’. When growing different varieties, make sure that you plant them separately to preserve original fragrance of each variety. Lemon Balm (Melissa officinalis) is an aromatic herb that can be grown in pots as well as in the ground under bright sunlight. The plant is grown for its highly aromatic leaves that are source of essential oil used in aromatherapy and traditional remedies. The leaves are also added in preparing soothing herbal tea. Oregano (Origanum vulgare) is source of flavorful leaves that are dried and sprinkled on food for extra flavor. Oregano is quite an easy herb to grow in herb gardens. It requires sunny exposure, regular soil mix and moderate watering. 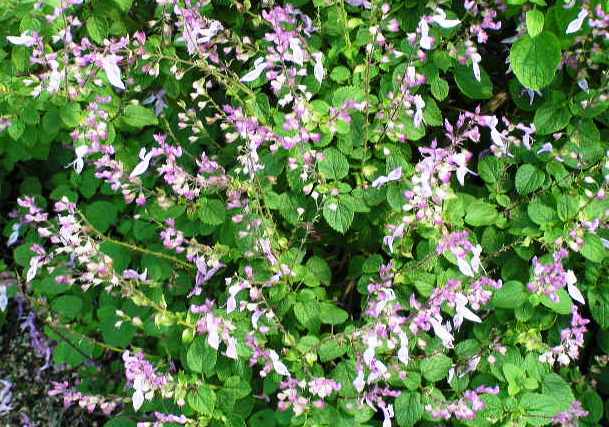 Oregano can be grown in pots as ornamental plants with small pink flowers. Chamomile is another popular herb among herb gardeners because of its medicinal benefits. Chamomile bears feathery foliage and daisy-like flowers. The flowers are dried and used for preparing soothing chamomile tea. 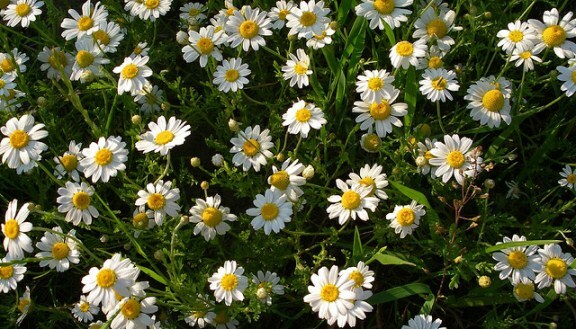 Chamomile has both low growing and sprawling varieties. Commonly grown species is Chamaemelum nobile that grows under full to partial sun and requires slightly rich soil. Flowers can be plucked in summer. Sage (Salvia officinalis) is a hardy herb with a bushy growth. The plant produces ornamental foliage which is used in many traditional recipes for culinary benefits. Sage can be propagated from cuttings planted in spring. Sage is not fussy about growing needs and survives neglect; however, it should be protected from long spells of cold and frost. Parsley (Petroselinum crispum) is grown widely in herb gardens as well as in commercial farms for its edible leaves that can be harvested almost all through the year. Parsley can be grown from seeds and grown under partial sun. It is a winter-hardy herb and grown well in the months of winter. 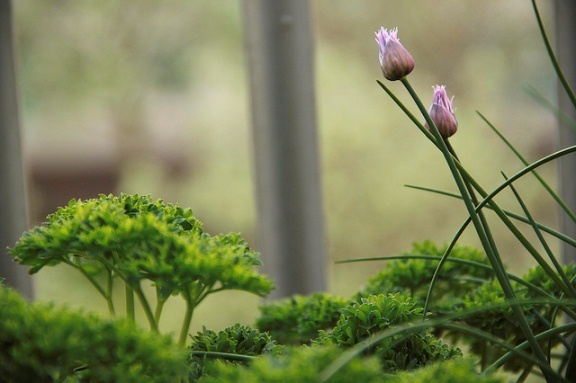 When grown in pots, Parsley makes an excellent ornamental plant as well. Like Sage, Thyme (Thymus vulgaris) is a hardy and drought tolerant herb that can be grown easily in a herb garden at home. It just requires a sunny exposure and well-drained soil. Thyme produces beautiful foliage which is used in salads and various traditional recipes. Besides culinary benefits, Thyme can be grown as an effective ground cover or as companion plant with various annuals and perennials. Rudbeckia is among the most favorite perennials of gardeners worldwide. It is easy to grow, offers a long flowering season, serves very well in landscapes, borders and mass plantations, and brings a variety of butterflies to the garden. If you are planning a mixed flower bed or border, Rudbeckia would be a nice addition. 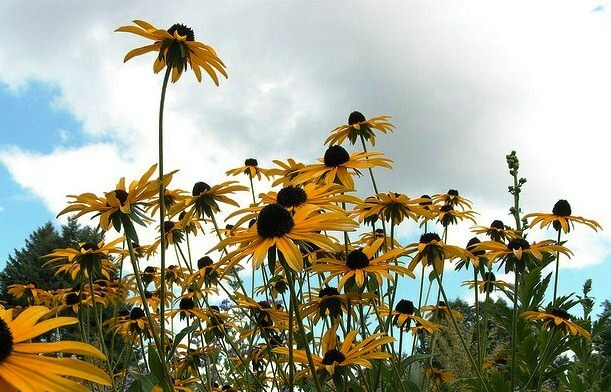 Most species of Rudbeckia are low-growing plants that bloom from mid-summer till fall. They are easily grown from seeds. Young plants require regular watering, however, once established Rudbeckia plants are able to tolerate brief periods of drought. They are not much fussy about food. A regular soil mix is good enough for these hardy plants. For healthy and long flowering period, regular deadheading of the faded flowers is usually required. Rudbeckia can also be propagated from divisions. The best spot for Rudbeckia plants is a sunny or partially shaded bed with a well-drained soil. Popular varieties include: Rudbeckia Fulgida ‘Goldsturm’, Rudbeckia Hirta ‘Double Glory Daisy’, Rudbeckia Hirta ‘Indian Summer’, and Rudbeckia ‘Toto Rustic’. 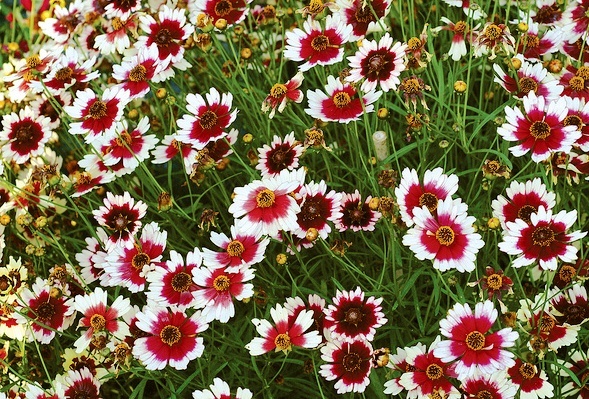 Coreopsis is a genus of perfect summer bloomers for beginners. They withstand drought, require low maintenance, and grow in many soil types and climatic conditions. Originally native to North America, there are more than 100 species and varieties of Coreopsis for almost all garden styles. Some of them make good border plants, some do well in hanging baskets, some make good pot plants and some from nice flowering clumps. Coreopsis are usually recognized for their daisy-like yellow or orange flowers that appear in summer and continue to bloom till fall – quite a long flowering season indeed. Almost all species of Coreopsis prefer lean and sandy soil in a sunny spot where they receive moderate watering. Established plants do not require much care and bloom very well without requiring additional fertilizer. Coreopsis grow easily from seeds. Most species tend to form mounds of low-growing herbaceous plants, usually suitable for container gardening, or as ornamental bloomers in mix borders or garden beds. Physostegia is a small genus of herbaceous perennials that are grown for their showy flowers. Most species produce white, pink or mauve flowers that appear on long stalks from mid-summer to early autumn. Physostegia plants are commonly known as Obedient Plant because the flower heads have tendency to retain whatever position they are moved to. You can actually move each flowers of Physostegia in whatever direction you want. This makes it a useful cut flower plant. The most popular of all species in this genus is Physostegia Virginiana. It is quite a vigorous grower and perfectly suitable for beginners. The best place to grow this excellent bloomer is a partially sunny location where it receives bright morning sunlight but protection from harsh sunlight for the rest of the day. 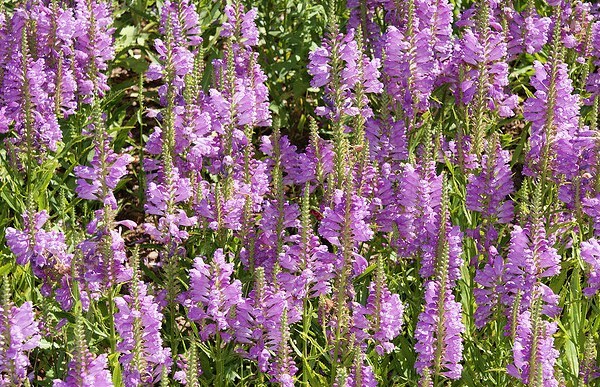 Physostegia Virginiana, like other species, requires moderate watering in a regular soil mix. Propagation is usually done from seeds or divisions. 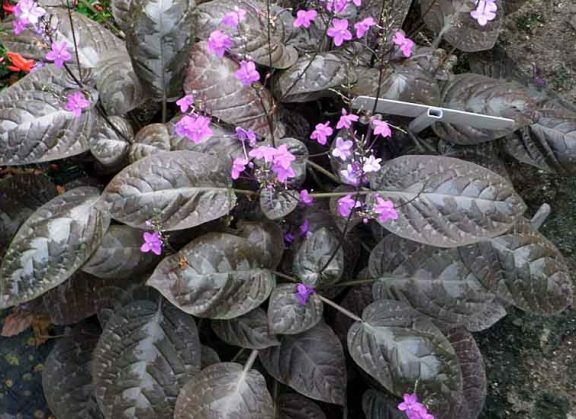 It is quite hardy plant and does not require any special care. Physostegia Virginiana performs well in mix borders as well as pot plants. Nepeta is a large genus of perennial plants that grow naturally in parts of Asia, Europe and Africa. Commonly known as Catmint or Catnip, Nepeta grow as small shrubs or subshrubs and herbs. One of the commonly grown species is Nepeta Cataria, which is a good candidate for a nice border plant or ground cover. The plant produces heart-shapes leaves and tiny flowers (of white or lavender shades) that usually bloom in summer. Flowers are fragrant and have purple spots on them. Because of a chemical compound called Nepetalactone naturally found in it, Catmint has long been used in traditional medicine as a sedative. It also acts as natural insect repellent which particularly keeps mosquitoes, cockroaches and termites. The chemical also affects cats and makes them drooling, sleepy or growling. Nepeta Cataria or Catmint is very easy to grow. Generally, it prefers sunny conditions, moderate watering and a well-drained soil. 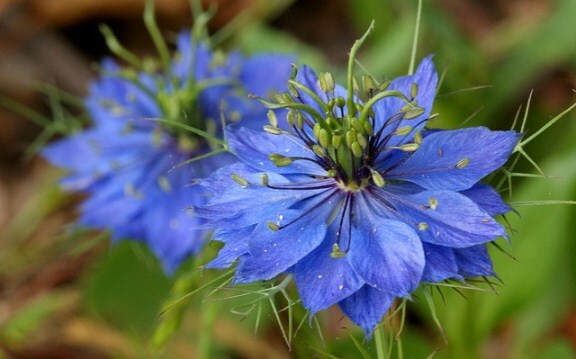 Love-in-a-mist or Nigella Damascena is a herbaceous annual from the family of Buttercup. Originally belonging to Mediterranean climates of southern Europe, Africa and Asia, this beautiful flowering plant has been a popular garden plant in most parts of the world. This lovely annual can be grown in flowers beds, mix borders or in empty spaces is garden. Popular for its dainty flowers, Nigella Damascena serves as an attractive plant even when not it blooms. Flowers are usually blue or violet that bloom in spring or summer. Flowers of Nigella Damascena are characterized by beautiful and delicate thin bracts that surround each flower giving this plant its common name – Live-in-a-mist. Nigella Damascena is propagated from seeds; usually sown directly in beds as they do not like to be transported or transplanted. Once established in your garden, it would self-seed to propagate itself. A sunny spot and regular soil mix with good drainage are sufficient for these hardy annuals. When in bloom, Nigella Damascena can be easily identified by its delicate flowers that can serve very well as cut flower. Flowers last long and are also dried for using in dry arrangements. Popular varieties of Nigella Damascena are: ‘Miss Jekyll’, ‘Oxford Blue’, ‘Persian Jewel’ and ‘Persian Rose’. Yellow Flax or Reinwardtia Indica is a small herbaceous plant from Pakistan, India and parts of China. Known for its rich yellow flowers, this beautiful flowering shrub is an excellent winter bloomer. 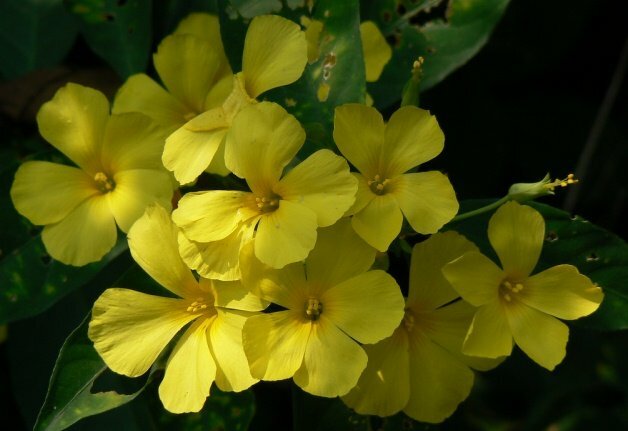 The plant grows up to 1 meter and bears sprays of bright and lovely yellow flowers from autumn to spring. Though the life of flower is not more than a day, but it continues to bloom quite frequently. “We are dust and to dust return. Yellow Flax is a shade loving plant though it can be grown under bright sunlight too. It can grow under trees or in mixed garden beds. For best results, provide Yellow Flax plants with plenty of water and grow in a rich soil.